What did you like about the book? 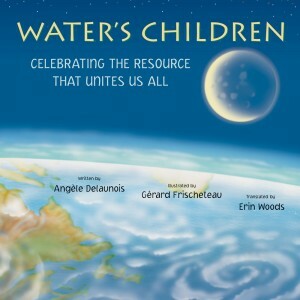 Each page of this book features a child or children in a different part of the world expressing what water means to him or her. There are warm climate settings, cold climate settings, town, farm, forest and desert settings. There is a balance of boys and girls depicted. Most are interacting with the water (or its products). Each page also shows how to write ‘water is life’ in the language the child would speak in that region…. [A] perfect set-up for a discussion during story time, a writing activity for older elementary students, a thoughtful art activity for children of any age. The text itself is poetic and dreamy. On repeated readings, it is almost a lullaby and could become a bedtime story. There are different colors and moods on every page. On some, the children look happy. Some are playing and some are working. Some pages are gloomy. Young readers will understand, through the text and illustrations, that some children struggle to get the water they need to drink and produce food….